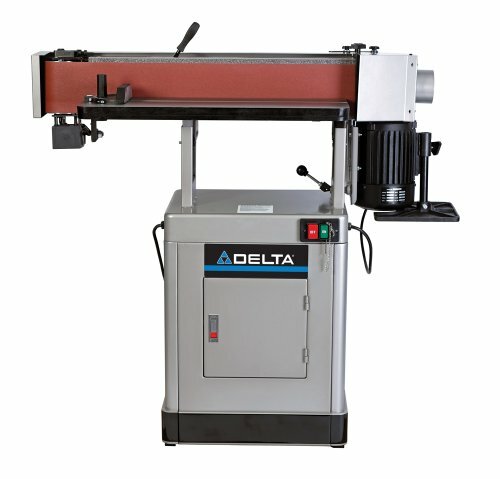 6-Inch by 89-Inch Oscillating Edge Sander; 1 1/2 Hp, 115/230V (wired 230V) 1 phase motor; Oscillating belt 108 OPM; Belt Speed 3,900 FPM; Cast Iron tilt table; Cast iron Contour Sanding Table; Fence; Dust Hood; Miter Guage; Backstops & Tracking Tool. Max Depth: Belt horizontal, including lever: 23 in. Max Width: Drum support table, mounted: 50 in. Max Height: Belt vertical, including lever: 49 in. Lowest Table Height: 38 in.